Welcome to another Grow Your Own roundup! I don’t know how the weather is in your area, but in Northern Virginia it’s been brutally hot. We had two straight weeks of temperatures in the 90s at the end of June and after a two day respite it continued into July. We’ve had to water every day to keep the garden alive, but so far it’s doing well and the tomato and tomatillo plants are loaded with fruit and the peppers are catching up. I can’t wait to start cooking with them. Thanks to all who participated in June. It’s always fun to read about other people’s gardens, farms, and foraging expeditions and I always find inspiration in the posts. Last month we created dishes with out homegrown basil, scapes, chard, chives, parsley, lemongrass, mint, chiles, and blueberries. If you had a Grow Your Own post in June and it’s not included here, please send me the information and I’ll add it. If you are new to Grow Your Own, you can visit the Grow Your Own page to learn more about the event. Even if this is your first year to garden, forage, hunt (that includes fishing), or raise your own animals, all are welcome to participate! Gudrun of Kitchen Gadget Girl is hosting the July event and the deadline for posts is July 30. Please see her announcement for more information. Anyone who participates is also eligible to host the event, so send me an email if you are interested and we’ll sign you up. 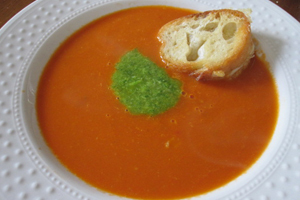 Julia’s beautiful tomato soup gets some added flavor with a pesto made from her homegrown garlic scapes and basil. 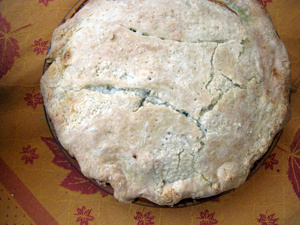 Pam’s wonderful pie is like a quiche with a top and bottom crust. It’s filled with her homegrown chard, chives, and parsley, and a decadent mixture of eggs, half and half, and gruyere cheese. 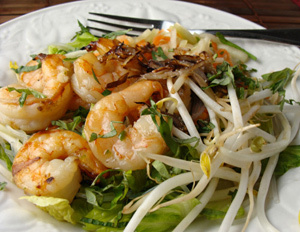 Light dinner salads are perfect for hot summers, and Kim’s Vietnamese-style salad is packed with flavor from her homegrown lemongrass, mint, and chiles. 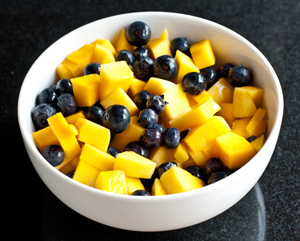 Our blueberry bushes are still young but producing more berries each year, and we enjoyed some of them in this fruit salad flavored with a ginger vinaigrette. Wow, I wish I had my own blueberry bush. They have to import blueberries to Kuching from the US, but at exorbitant prices. So I haven’t had fresh blueberries in over a year! Sorry I missed participating in this month’s roundup. I should have something to add for the next one.